Any time people loose teeth, they become candidates for Reconstruction Dentistry. The more teeth that need restoration or replacement the more complicated the case becomes. When only one or two teeth have cavities, we consider that to be Basic Care in most cases. Our dentists in Colorado Springs restore the teeth using full crowns or filling material called Composite. When many teeth have cavities we call this ‘rampant decay’ and the treatment to restore the mouth becomes more involved. Gum Disease is the single most common reason people loose teeth. It is a condition where bacteria becomes established beneath the gum line, and hard deposits develop. These hard deposits can only be removed by a dental hygienist. Because it is usually painless, the person tends to postpone and neglect treatment. When caught early, the treatment is fairly simple and successful. A deep cleaning to remove calculas and tartar that has formed beneath the gum line is usually all that is needed. However, if the person allows the gum disease to continue, the teeth will become loose and eventually fall out. This is the single greatest reason why dentists in Colorado Springs for prescribing removable dentures and partials. Reconstruction involves placing dental implants then anchoring bridges to the implants. The limiting factor when treating a person who has lost teeth due to Gum Disease is whether the person has enough jaw bone to secure the implants. If the gum disease has been severe, the bone that is left may be too thin and limited to secure a good outcome. Without a doubt, bite is the most misunderstood and neglected of all dental treatment. When the teeth do not mesh together properly, the result can be severe. One of the most common symptoms of bad bite are teeth with enamel fractured off at the gum line (called abfractions). Many dentists in Colorado Springs simply fill these fractures with white filling material. Many people think these small fractures are abrasions due to brushing their teeth too vigorously. That is not the case. Abfractions are due to stress on those teeth when they chew. Because the teeth do not fit together properly, they are forced to move just a little when they chew. They don’t move much, but it is enough to fracture the enamel. 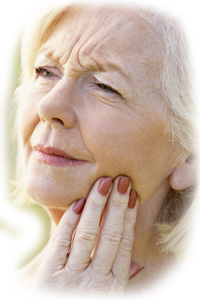 Bad Bite can also result in headaches and TMJ pain, often quite severe. Correcting the bite will often correct headaches, TMJ and other facial pain.